In writing this post about Are My Armpits Still Irritated? A 3-Week Update I am participating in a campaign on behalf of Mom Central Consulting for Dove. I received product samples to facilitate my review as well as a promotional item as a thank-you for participating. So, as I mentioned in the previous post, I’ve been using Dove Clear Tone deodorant for the past few weeks to see if it would help my red, itchy and irritated underarms. Has it really helped my armpits not be so irritated, though? Surprisingly, my answer is a resounding yes! Since about a week after using Dove Clear Tone deodorant, I really started noticing a difference. Around this time, I found my underarms started feeling a lot more moisturized and weren’t nearly as dry as they had often been in the past. After another week or 2, I also stopped seeing many of the bumps and redness! I am so pleased with the results and hope it sticks through until next summer so I can feel much more confident about wearing sleeveless shirts. My only real “complaint” about the deodorant is that in my experience, it didn’t really provide 48 hour moisture protection, but I tend to sweat a lot anyway and reapply every 24 hours, so this didn’t realize surprise me. Even if I did have wetness, there was no odor at all, though. All in all, this is a deodorant I would recommend to any ladies that also have issues with irritation, redness and drying of the underarms. 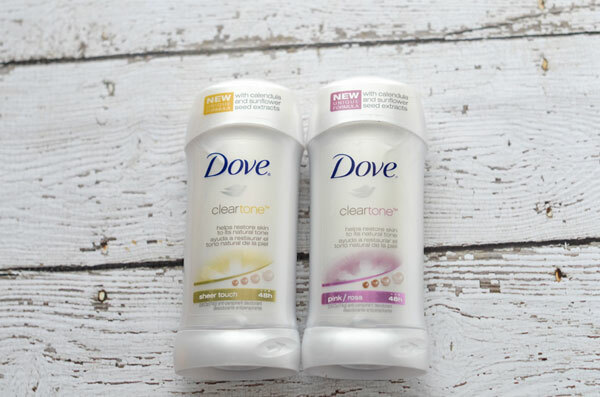 I know that I will definitely continue using Dove Clear Tone Deodorant as it is the only one I have ever tried that actually provided relief!